I love channeling my Gram in the kitchen when I use her old cast iron skillet. In fact, there are a lot of times that I’m cooking when I feel like she’s with me, especially around the holidays. I have several of her pans and skillets, but this cast iron one is by far my favorite. I miss her a lot (she passed in 2009, just shy of her 93rd birthday), but I feel her presence every time I use it. My mom says that my fried egg sandwiches taste just like Gram’s and that is the best compliment ever. I don’t use this skillet as often as I should and would like to, but it’s the best thing for frittatas, frying foods (not that I do that very often), and cooking/braising meat. It’s 10.5 inches across and 2 inches deep. Made in the USA, as was almost everything back then. In case you missed my Cheesy Broccoli Egg Muffins post, breakfast is my favorite type of food and I would eat it all day long if I could. 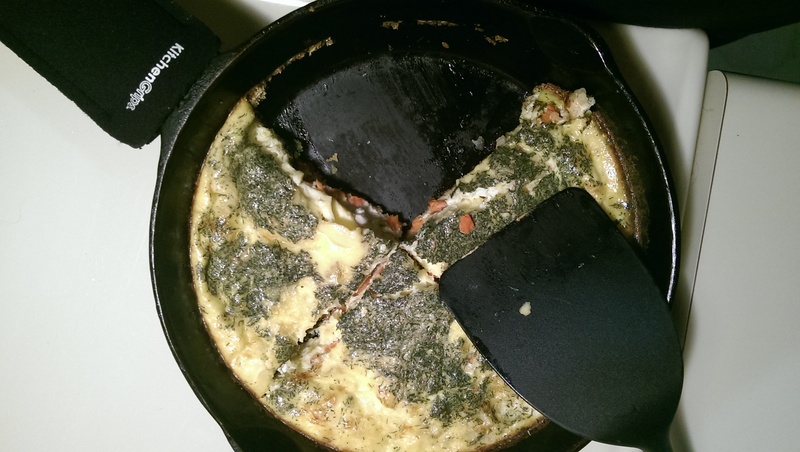 My favorite way to eat breakfast for dinner, or brinner, is in the form of a frittata. To me, frittatas are so much tastier than an omelette and way healthier than a quiche. And you can make up any kind of frittata combinations you want! Trust me, I do it all the time. This combination was created based on what was in the fridge since I was feeling too lazy to get to the store. We love all salmon, especially lox, and I usually have a thing or two of goat cheese in the drawer. Easy peasy. 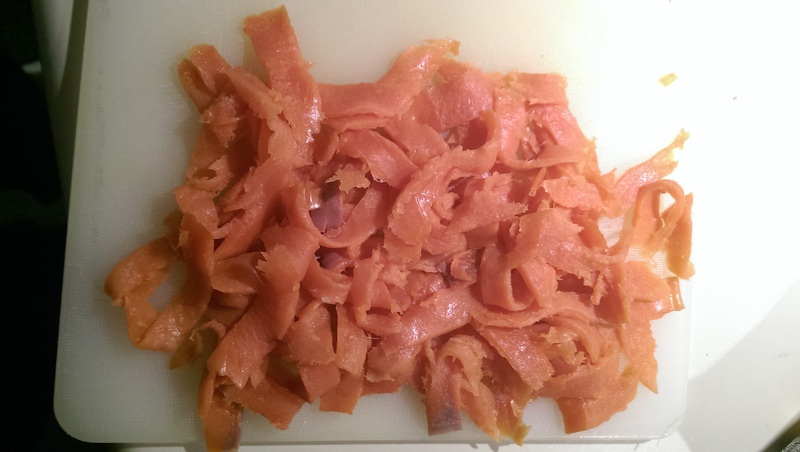 The easiest way that I have found to deal with packaged lox (the pieces can be very sticky to each other) is to take the slab of slices and cut them all in long strips. Then I loosen them up and separate them as best as I can. I hate when they all clump together in the egg mix and you are left with huge bites of smoked salmon in random places of the frittata and nowhere else. The same thing goes for the goat cheese. I have struggled a few times with how to handle the brick of cheese that I usually have in the fridge. Of course if you buy or have goat cheese that is already crumbled, this next part won’t apply, but it’s cheaper to purchase this way and now I have a trick to share. I cut it up while it’s still in the package. 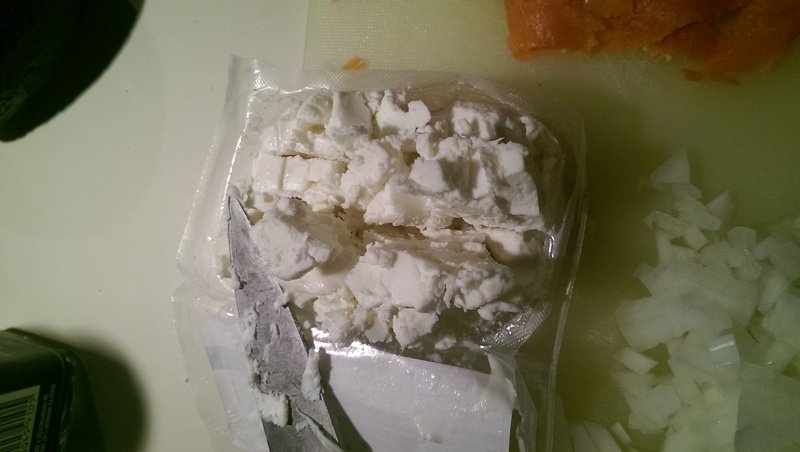 Goat cheese is so soft and very difficult to cut no matter what way you want it to be, so I have learned to do it this way if I want it to be close to the size of crumbles. 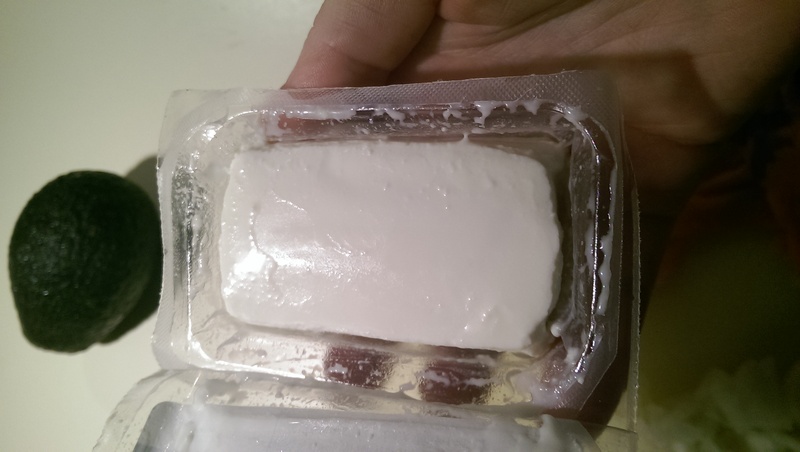 I make cuts both vertically and horizontally in the package, and everything stays in the plastic until I’m ready to dump it in. It still isn’t as perfect as prepackaged crumbles, but you never know what else might be included in those packages to keep the cheese clumps all nicely separated. Now I’ll talk about my butter. 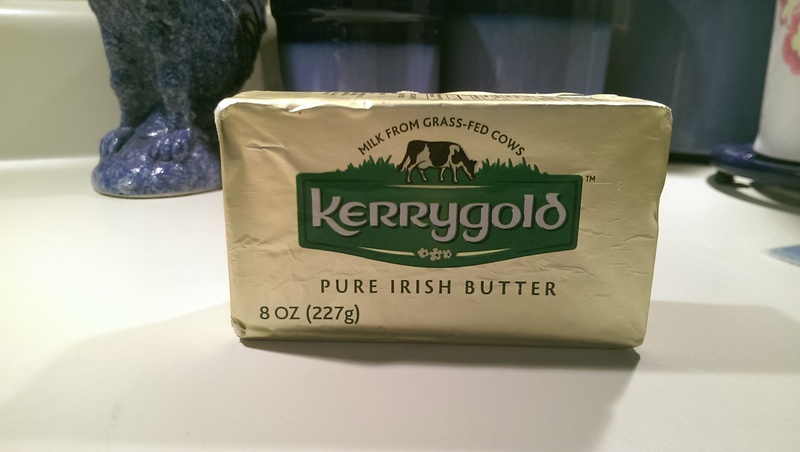 Unless I’m about to do a bunch of baking for a party or something that will involve a lot of butter, I usually only purchase Kerrygold from the store. If you have time and patience to make your own or spend extra pennies on something better, by all means. For me and my cheap, half-crunchy bum, I’ll go with this one. And I swear it tastes different than the rest of the ones in the dairy case at your regular supermarket. When using cast iron, I don’t bother with anything of low quality. My pan is perfectly seasoned and I’m afraid of using anything that isn’t close to what it has been used to its whole life. You know, like food. Not “organic,” not “non-GMO,” not “grass-fed,” “free-range,” or “rBGH-free” because these things never existed back in Gram’s day. 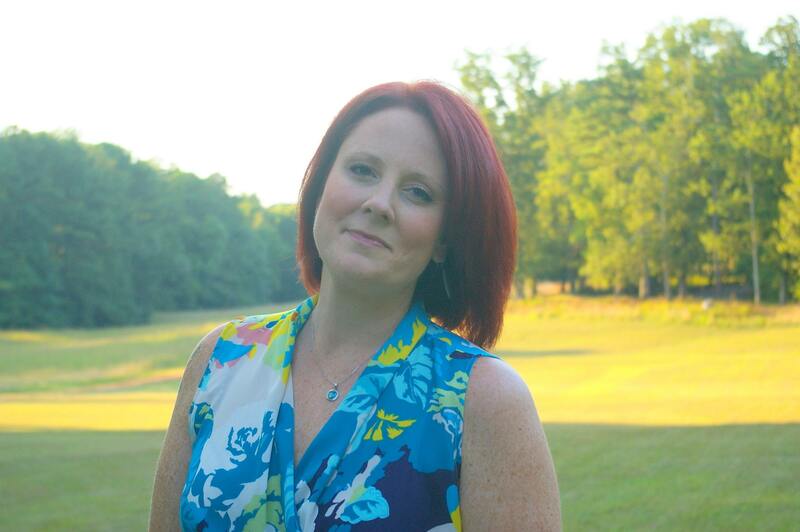 Animals and crops were naturally raised and we dealt with bugs and disease. People still ate. Farmers were respected. People didn’t have all sorts of crazy allergies to food and the environment, and the general population was not nearly as sick as we are today. Okay, I’m getting off my soap box now. Sometimes I just have to rant and get this stuff out. Back to the recipe. After prepping the salmon and cheese, it’s time to get going on the onion and garlic. Chop a small onion finely and mince two cloves of fresh garlic. Melt 1 Tablespoon of butter in the skillet over medium heat. Add the onions and garlic, and saute about 3 minutes. While they are sauteing, whisk 10 eggs in a large bowl with 1/4 milk, if you do dairy, sea salt, and fresh ground pepper. If you don’t do milk and have nothing else to add in its place, use a tablespoon or two of water to help make the eggs fluffy. 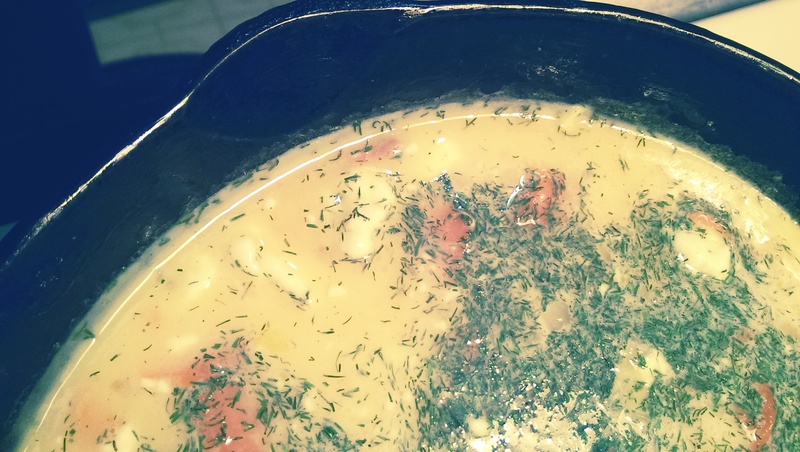 Add the sliced smoked salmon, the goat cheese, and 2-3 Tbsp dried dill (fresh is WAY better if you have it, but I was all out) to the egg mixture. Pour egg mixture over the onions and garlic, slightly stirring to combine. Turn the heat up to medium high and cook until the edges start to firm and climb up the side of the pan a little and bubbles start to appear. Transfer it to an oven preheated to 350ºF and bake for about 25 minutes. It should look nice and golden on the top when finished, and a toothpick should come out clean from the middle. Slice and serve! It goes well with a nice green salad with a mild dressing. One last shot to show how well a wonderfully seasoned pan can work. It helps that this pan is older than me and that I have loved on it just as my Gram did. Once you get used to using one, you will be in love as much as I am. This simple recipe can help you get dinner on the table in about 35 minutes with very little prep work. It goes well with a small side salad for dinner, and the leftovers are great for any meal! 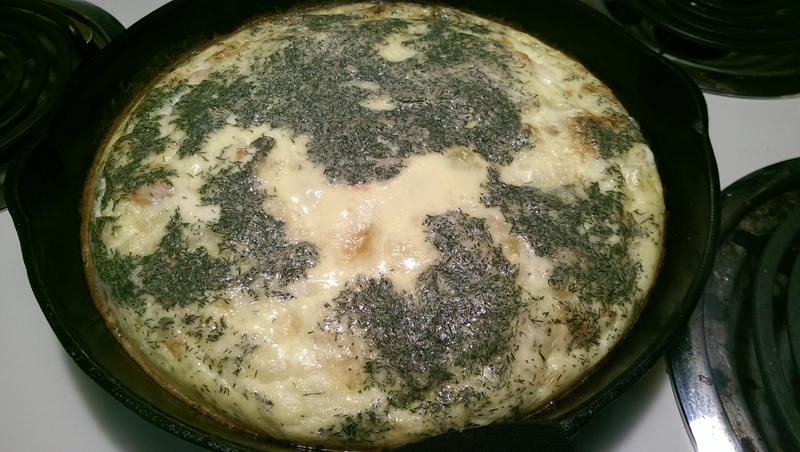 Heat 1 Tbsp butter in a deep or large ovenproof skillet over medium heat. 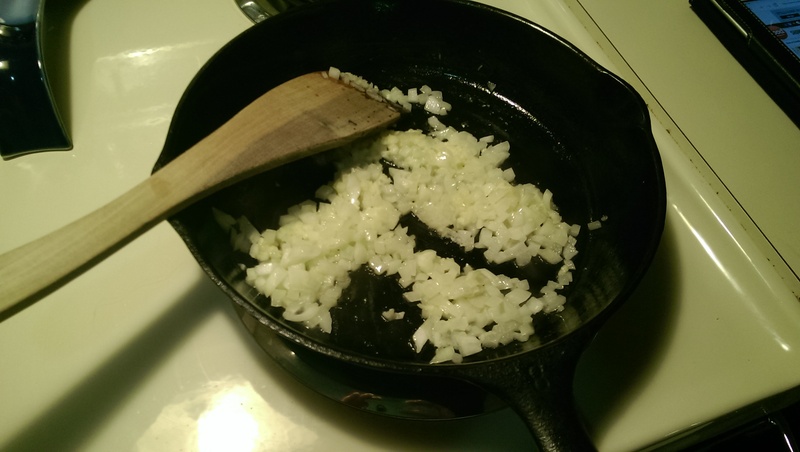 Once melted, saute onions and garlic for about three minutes. While onions and garlic saute, whisk together the eggs and milk/liquid, salt, and pepper. 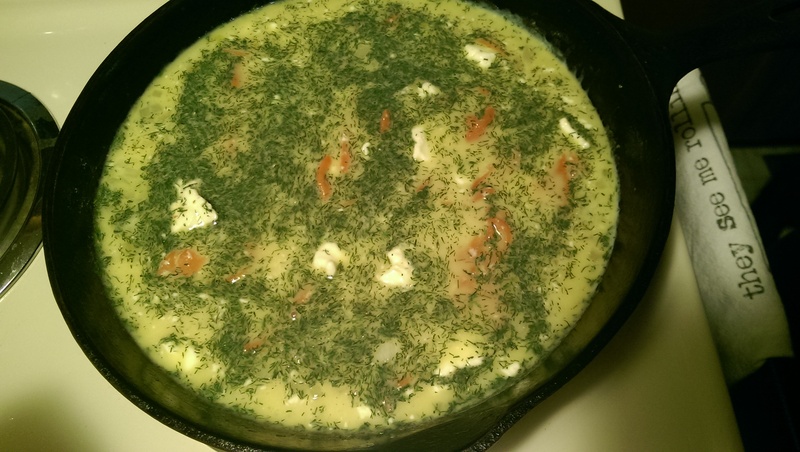 Add salmon, cheese, and dill to the eggs and stir to combine. Pour egg mixture over the onions and garlic, give a quick stir, and raise the heat to medium-high. Cook until the edges start to firm and climb up the pan and bubbles start to form. Transfer pan to the preheated oven and bake for about 25 minutes until golden brown on top and an inserted toothpick comes out clean. Serve with a lightly dressed green salad. Enjoy! 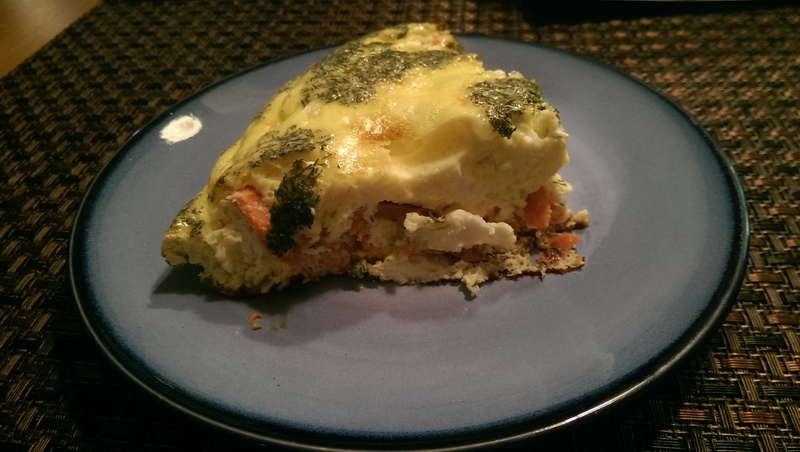 Categories: budget-friendly, gluten-free, recipes, Uncategorized | Tags: breakfast, brinner, eggs, frittata, gluten-free, goat cheese, salmon, smoked salmon | Permalink.